November! You came and went so fast, it seemed. But you brought us much to chew on, and for that we’re thankful. It’s your eleventh This Mesozoic Month of 2018, and it is stuffed to the max. The passing of Ralph Chapman hit the community hard this month. Our condolences to his family, friends, and colleagues. Another big, charismatic dinosaur is up for auction [PDF link], and as ever, these companies try to make it look all sciencey and legit. They usually fail, and Lisa Buckley fairly eviscerates this particular auction, as well as explains why these mounts are such a squandered opportunity, having not been collected ethically. The oldest known long-necked sauropodomorph has been published, discovered at a late Triassic Brazilian dig site holding three well-preserved specimens. The new member of unaysauridae has been dubbed Macrocollum itaquii. Its teeth suggest omnivory and the cluster of skeletons are interpreted as showing gregarious behavior. An important find to help flesh out the early history of sauropodomorphs, and another example of Brazil’s importance in sussing out this facet of dinosaur evolution. Read more from Gemma Tarlach at Discover, Fer Castano at Letters from Gondwana, and Jane Dalton at the Independent. A new dicynodont, friends. A new dicynodont so big it was first assumed to be a sauropod when its fossils were first found. It’s Lisowicia bojani, the largest yet known non-dinosaurian Triassic beast, the largest stem-group mammal to walk the Earth until the Eocene. No sprawler was she, walking on upright limbs. Closed access paper here; read more from Hannah Osborne at Newsweek. and Gretchen Vogel at Science. Confuciusornis is the latest fossil bird to have its plumage coloration, or at least patterning, revealed by modern technology. Read more from Brian Switek at SciAm. Ring the ceratopsid alarm! We’ve finally got a new taxon for 2018: Crittendenceratops krzyzanowskii from the Fort Crittenden Formation of Arizona. A member of Nasutoceratopsini, the latest surviving member of the subclade. Read the free PDF here and check out Novataxa’s post, which includes skeletals and a fine reconstruction by Sergey Krasovskiy. As pointed out by Tom Holtz on the Dinosaur Mailing List, this is actually the first marginocephalian description of the year. A major study reevaluating the pterosaur fossils of the Middle Jurassic Stonesfield slate not only describes a new taxon, Klobiodon rochei, it utterly blows up the genus Rhamphocephalus: R. prestwichi turns out to have been a misidentified crocodylomorph, R. depressirostris turns out not to have any diagnostic characters past the family level, and sadly, R. bucklandi has gone missing entirely. Read the open access paper here. Mirarce eatoni is a newly described North American enantornithine from the Kaiparowits Formation, and it’s a big boi. Discovered way back in 1992. Read the PeerJ paper here, and more from Fer Castano at Letters from Gondwana, Mike Taylor at SV-POW, Mike Walley at Everything Dinosaur, and Brian Engh’s post about his reconstruction here. Reaching back juuuusssst a bit beyond our usual Mesozoic wheelhouse, meet Gordodon kraineri, the first edaphosaurid described in three decades. And check that specialized dentition: front and rear teeth made to nip and grind, respectively, with a gap between that wouldn’t appear in the fossil record again until the late Triassic. Read more from Mark Mancini at How Stuff Works. When Scaphognathus crassisrostris was described way back in 1831, August Goldfuß wrote about fuzzy integument and published one of the earliest examples of paleoart. These aspects of his work were largely overlooked for decades and decades, but now a new publication says that he was right. Using new technologies of Reflectance Transformation Imaging and UV light, a team of researchers have confirmed what Goldfuß saw. Read the paper here. Thanos, the scariest purple guy this side of Barney and Grimace, has his very own abelisaurid genus named for him now, based on a vertebra. Check the paper here; Andrea Cau is skeptical and Zach Miller is just in love with it. The smallest dinosaur tracks yet found have been described, belonging to juvenile – or just really small adult – dromaeosaurs. Read the paper here; more at Phys.org. More ichnology: an updated look at an older publication on ornithopod tracks from dinosaur ridge in Colorado, interpreted as an animal “tip-toeing” on the bottom of a river as it fights a current. See the paper here. One I missed in October: Ali Nabavizadeh’s paper on cheek analogs in ornithischia. More from Brian Switek at Laelaps. And do check out Jaime Headden’s illustrations: Panoplosaurus, Edmontosaurus, and Psittacosaurus. John Pickrell wrote about the Picturing the Past paleoart exhibition and the practice of paleoart at National Geographic. At Time Scavengers, Mike and Jen write about one of my favorite pastimes on my own campus: urban fossil hunting! I’m at a university built of Mississippian limestone; theirs is made of older stuff, constructed of Silurian stone. 2018 has been a killer year for rebbachisaurid sauropods. Justin Tweet talks about these diplodocoids at Equatorial Minnesota. Check out a new set of book reviews from Herman Diaz at Art Evolved, with Larry Witmer’s The Search for the Origin of the Birds and a children’s book called If You Were Raised by a Dinosaur. Can we know how flexible the necks of sauropods were? Mike Taylor is skeptical. Nick Schofield talks about fossil record bias in the start of a new series of posts at Rex Machina. His first post is about the vagaries of how an organism is preserved in the first place. At Dino Dad Reviews, take a look at a children’s book about Qianzhousaurus and the rest of the tyrant clan, illustrated by Julius Csotonyi. The story of how Giraffatitan was discovered and excavated from Tanzania is one you should definitely know. Buckle up, Phil Hore tells the tale at Bone Rooms. Everything Dinosaur shares the upcoming dinosaur models from Collecta in a two-part post: begin here. Love that Borealopelta! Ian Garofalo discusses the taxonomic battle of “Rioarribasaurus” vs. Coelophysis. It was #DrawDinovember, and naturally, Natee did not disappoint. Making the same joke every palaeo nerd in your life is today: during the Mesozoic, the 'turkeys' eat you. Citipati with Zalambdalestes. I reworked last year's sketch (thereby destroying every semblance of vitality the original had 🙃). The SummonENGH was a huge success! check out Brian’s wrap up video announcing the winner and many honorable mentions. Our boy Asher and Tiffany Turrill join Blake Smith to talk Appalachian folklore and Anna O’Brien: Ghost Days on Monster Talk! Colorado State University takes us into the field with this video about the Sandy Site, a Hell Creek dig site. Phylopic is in need of some critical updates to improve functionality and searchablity of silhouettes. Help Mike Keesey improve the site with your Indiegogo pledge. It’s certainly deserving of a cash infusion from the community, as it’s used so widely to create informative and beautiful figures for scientific publications. Let’s send Cam Muskelly to the Southeastern Section GSA meeting next spring! Here’s the GoFundMe link. Does a dinosaur RPG in an urban setting sound like fun? Check out Raptor in the Room, now raising funds on Kickstarter. You get to “…play as one of the many criminals whose mission it is to secretly raise and nurture dinosaurs…” for the mob. Crystal Palace Dinosaurs final stretch! The Friends of the Crystal Palace Dinosaurs are in the last few weeks of their campaign to build a permanent bridge to the islands where the famous sculptures reside. To help make it happen, pledge here. ICYMI: The 2018 Dinosaur Gift Guide. And here are a couple more artists deserving of your hard-won rupees! Drowsy tyrants never looked as cool as in Raven Amos’ vaporwave-inspired new design. Savage! 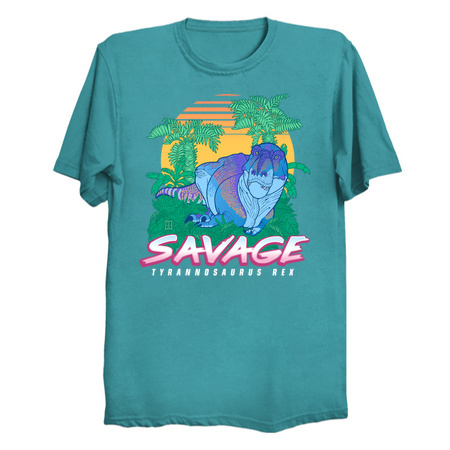 Get your tee at Neatoshop. 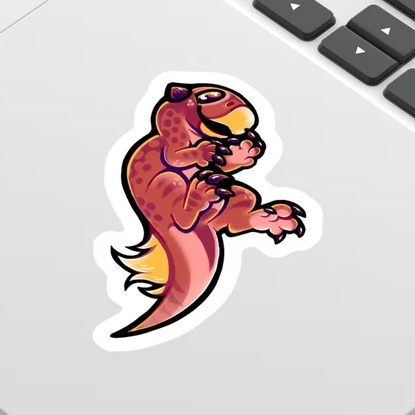 Get a load of this adorable Psittacosaurus by Luca Crow! Available as a sticker, tee, pillow and more at Society6. When I saw Eldar Zakirov’s Bauria, I immediately wrote to ask if I could feature it here. Just gorgeous. It feels like it could be a color plate from a Victorian-era natural history tome. 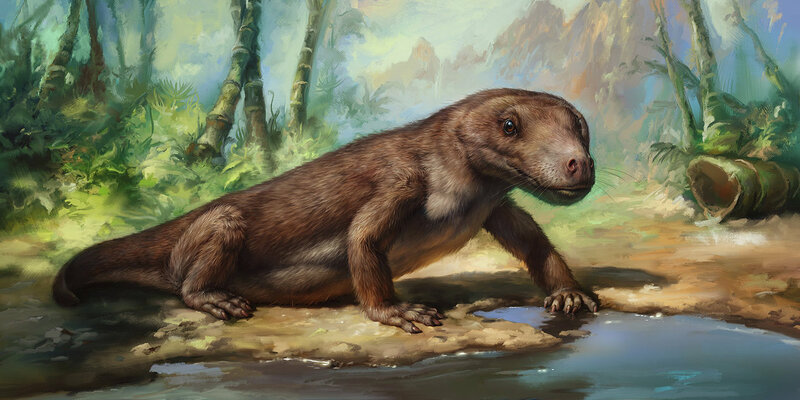 This cutie is a theriocephalian hailing from the early Triassic Burgersdorp Formation of South Africa. Check out Eldar’s awesome art portfolio and his shop, which doesn’t have any of his paleoart, but his Photoshop brush sets may be of interest.